There are many reasons remote work has become so popular. A remote workforce can increase productivity, with quieter environments and fewer distractions. They improve health and well-being for workers and decrease travel-related environmental impact. With lower turnover rates, your business is also able to widen its talent search as they aren’t limited to a small geographic region. The list goes on. Of course, managing and optimizing remote talent has its challenges. For example, according to Entrepreneur.com, “one of the biggest negatives of remote work continues to be the feeling of isolation and disconnectedness telecommuters often report.” While managers are effective at keeping the cohesion among team members about the office space, it poses a challenge to keep that up with remote workers. Self-discipline is the key quality when looking for remote workers. The right employee must know how to micromanage themselves. Hire a professional with an entrepreneurial spirit or a passion for their work. Since they will be overseeing themselves in a sense for most of the workday, this self-motivation and excitement are critical to their success and as a successful employee. With motivation in mind, setting clear and attainable goals for your remote workers will not only share your vision with them, but it will set their purpose. Remote workers are especially in need of connecting with an organizational purpose as they are void of the daily and physical contact that can ensure their work has meaning. Remote work does not have to mean isolations. Most people want to be part of a team and collaborate on tasks and projects. Many even do their best work as a result of these people-to-people connections. When people are connected with people, they gain a sense of belonging. Try using video communication such as Google Hangouts, Zoom or Skype. Encourage connection through in-person meetups at least twice a year if possible. Use a social onboarding platform to unite the team. Keep the process simple. Although you want to hire talent that is capable of micromanaging themselves, remote workers still need structure. Clear, easy to find and simple to follow processes can take much of the anxiety out of completing day-to-day activities for remote workers. One way to do this is to make use of the surmountable technological apps that are available to you. Workflow and project management tools such as Basecamp, Asana, and Trello are some great examples. These apps can enable real-time and continuous performance feedback, learning, and coaching that keep your workers aligned in your company’s process. Every employee loves recognition. Multiple studies have even shown that “employees value recognition over financial compensation. This could mean taking them aside to show your appreciation or giving a gift. Feedback improved productivity and increases motivation. Since remote workers are not in the office every day, they might be unaware of how management gauges their work. 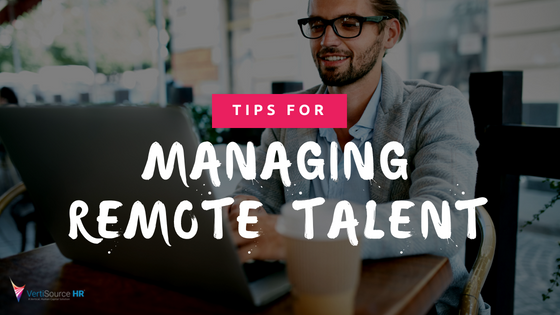 Make sure to create time, perhaps twice a year, to have a one-on-one meeting with your remote talent to go over their performance or the written feedback you have created. This is a great effort to show they are valued, included in the team and essential to your business. Looking to attract top talent? Check out our post “5 Ways to Use Tech to Motivate and Attract Top Talent”.